Centuries ago majority of those belonging to the higher caste, mainly Brahmins considered Goddess Mariamman to be non Brahmin deity as she was worshipped by the villagers who according to them were lower in caste and status compared to them. Those in the villagers worshipped Goddess Mariamman by practicing animal sacrifice and offered blood of animals in her sanctum to appease her as in their opinion she was inexorable and vindictive if improperly propitiated. The villagers worshipped Goddess Mariamman seeking her grace to bring rain to quench their thirst and wet the parched lands for cultivation. Most of the villages were full of agricultural lands and agricultural activity was the only source of income that fed the villagers. Hence timely monsoon was most important in their life. Goddess Mariamman was therefore worshipped by the villagers seeking her grace to end drought by bringing rain to fill the dried lakes and rivers which supplied water to farm lands whenever the rain failed, lest non availability of food will starve the people to death. It is undeniable fact that the cult of Goddess Mariamman worship emanated only from the villages. The wrong notion that Goddess Mariamman belonged to the non Brahmins class remained alive for many years when deep rooted caste division as Brahmins and non Brahmins prevailed all over the country. Animal sacrifices was not the only cause of hatred and anathema to the Brahmins towards Goddess Mariamman, but also they felt that her worship originated from the tribal religion of Dravidian forces before the arrival of the Aryans who belonged to the higher race of Brahmins. The Brahmins considered themselves to be superior Aryans and therefore they imposed self restrictions not to worship the non agama deities in the villages nor to visit the temples visited by the lower caste people who were non Brahmins and lower in status to them. The Villagers were generally God fearing and in order to protect themselves from the evils and unnatural spirits and ghosts, they worshipped even unknown Gods. The villagers in those days were very poor and toiled in agricultural fields for food and since they were not permitted to enter the agama temples where the rituals performed were agama in nature, they began to worship unknown deities in different forms, including plain stones and pillars believing them to possess with the spirit of God in the villages. The deities worshipped by them were enshrined in the open places or under small roofs or even under the trees in the villages and therefore the deities worshipped by them were generally considered as village deities. The appearance of the deities was also quite different from the deities enshrined in the agama temples and therefore Brahmins considered the village deities to be subordinate or servant deities to Agama Gods. Thus Goddess Mariamman as worshipped by the villagers was not accepted by the higher caste especially the Brahmins who held sway over rulers who considered Brahmins to be authorities in rituals and vedic sasthras. However the feeling slowly began to fade away when the true aspects of divine forces and the reason for the manifestation of various deities, one amongst them being Goddess Mariamman, were preached by several spiritual gurus who appeared in the scene broadening the spectrum of Hinduism. When puranic tales were cited and stories spread by the spiritual gurus, it was realized that Goddess Mariamman was an aspect and emanation of Goddess Parvathi and she has been created for certain cause by none else than Lord Shiva himself. Against this background epidemics like small pox, chicken pox and dreaded diseases like plague began to surface in several areas mainly in villages and spread to the cities. Even medical treatments failed to control and eradicate them and there were deaths too on account of its severity. There was widespread belief that Goddess Mariamman was goddess of dreaded diseases like smallpox, chicken pox, and other diseases. There was a general belief that she was authority to induce rain and her role was ambivalent, for she could create innumerable problems by spreading diseases and if propitiated properly she protected them from the calamities. How did the belief originated is not known. Pushed to the wall, when even medical support eluded the those affected by measles and nowhere to go to get relief, people in the city too began flocking to Goddess Mariamman temples seeking relief and protection from the dreaded disease taking a cue from the villagers who worshipped Goddess Mariamman and got relief like a magic when their prayers were answered. The cult of Goddess Mariamman thus spread breaking all the bearers of caste and creed. The negative mindset of the learned pundits too began to slowly vanish when the spiritual heads who sprang from many places began enlightening the public with the facts from Puranas about the various aspects of divine incarnations and the purpose for which they were created. 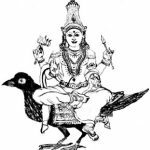 They repeatedly preached that several deities, sub deities of main deities were created from the energies of main Gods and Goddesses for performing specific acts and that Goddess Mariamman was thus created for bringing rain when it failed and cure diseases such as small pox and chicken pox. When the fact that Goddess Mariamman was the aspect and emanation of Goddess Parvathi was gradually realized, even the rulers in many parts of the land began to raise temples for Goddess Mariamman and practiced worshiping her regularly. Against this background emerged the temple of Goddess Punnainallur Mariamman in the district of Tanjore in Tamilnadu. The temple is situated around 5-6 Kilometers from Tanjore city in between river Cauvery and Kollidam in Tamilnadu. Read the interesting history surrounding to the temple. Once upon a time the Maharashtra rulers were ardent devotees of Goddess Mariamman. One of them was Venkoji Rao, decedent of Chathrapathi Shivaji, hero of Maratha rulers. 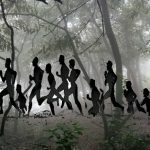 In the year 1680 when he visited Samayapuram which was under the Maratha rulers, to worship Mariamman, one day Goddess Punnainallur Mariamman appeared in his dream and told him that she lay buried in the forest of Punna surrounded by dense trees at a distance of about 3 miles from Tanjore and indicated a particular spot (where the present temple exist now) and said if the King dug her out and construct a temple and worship her, she would protect his kingdom and his state would also prosper extensively. Acting on the dream the King immediately took action to dispatch his men to the spot which was indicated by Goddess Mariamman in his dream to dig out the idol. But when his men reached the spot indicated by the Goddess Punnainallur Mariamman, they could see only a big snake pit, surprisingly white in colour in the same spot. Unmindful of the snake pit, the King after consulting his Raja gurus decided to treat it as Goddess Punnainallur Mariamman and constructed a temple surrounding it there without dismantling the snake pit. Much later when one of the greatest spiritual gurus called Swami Sadasiva Brahmendrar visited the temple site, he created the image of Punnainallur Mariamman on the snake pit with his yogic powers and enshrined it afresh along with a powerful Yanthra in the sanctum. The tantric Yanthra was charged with powerful mystic powers and thereafter people began to flock the temple to worship the deity in the name of Goddess Punnainallur Mariamman. The real life story of Swami Sadasiva Brahmendra- who he was, from where did he appear and the details of his parents or his disappearance etc are not much known. 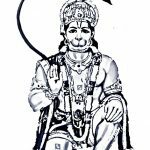 He was considered to be the Siddha Purush with highest yogic powers among the saints belonging to the 17th and 18th centuries. He possessed powers to see God not only by himself, but used to show them to his ardent disciples too and enlightened them. It was custom in those days that those afflicted with the measles used to take bath in hot water boiled in sun light to reduce the impact. However as days passed, devotees suffering from measles used to visit Punnainallur Goddess Mariamman temple praying for speedy recovery and came to the temple site, stayed around the places there and took bath in the temple complex itself. The Goddess here is considered to be very powerful and those who are afflicted with disorder in any part of their body offered mud dolls similar in appearance to the affected part and prayed for speedy recovery of the affected part. The belief is so strong that when sincerely offered prayer in this manner, the patient gradually gets relief in a few days. Mud dolls similar to the bodily parts are also available in the precincts of the temple. The Goddess Punnainallur Mariamman is considered to possess eight powers of energy to grace her devotees. It is said that the daughter of one of the Maratha Kings Tulaja Raja of Tanjore, who lost her eyesight in an illness, regained it on offering worship at this temple. There is another folklore on this temple. Once Lord Siva fought a war with a demon named Tanja who was troubling everyone in devaloga. The demon Tanja who was in devaloga was bestowed with special boons to the effect that he will be invincible and will meet death only when he entered a ring of fire caused by the mystic energy created with the energies of Lord Siva and Goddess Parvathi along with rain. It was destined that such an energy can be created by Lord Siva only once and that too along with the power energies of his consort Goddess Parvathi. Lord Siva had earlier bestowed many boons to him including invincibility. When his torments in devaloga crossed the limit Lord Siva came in another form to destroy him, but he ran out of devaloga and hid himself in the present day Tanjore. Immediately Lord Siva created a ring of special mystic fire rings consisting of male and female energies (energies of both Lord Siva and Goddess Parvathi) along with rain thus blocking his escape from all eight corners (called Ashta Disha meaning eight corners) of Tanjore. One of the eight power energies was Goddess Punnainallur Mariamman. Unable to escape, the demon died. 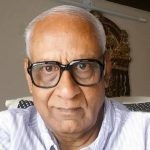 With his death the power energies got buried into the land in many places across the country (it was plain land without any borders then) and wherever female energies lay buried, Goddess Mariammans manifested in various forms says the pundits. This could also be the reason Goddess Mariammans the emanations of Goddess Parvathi are only bestowed with special power to bring rain even though the rain God is Varuna. 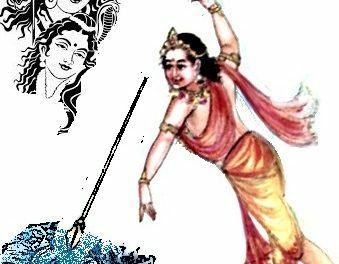 Since Lord Siva and Goddess Parvathi are Parasakthi who created the universe, rain God Varuna had to comply with her orders of Goddess Mariamman,emanation of Goddess Parvathi whenever she asked him to rain in a particular place. This may have been realized by Swami Sadasiva Brahmendrar and therefore he may have visited there to give a form to the mystic power released by Lord Siva. 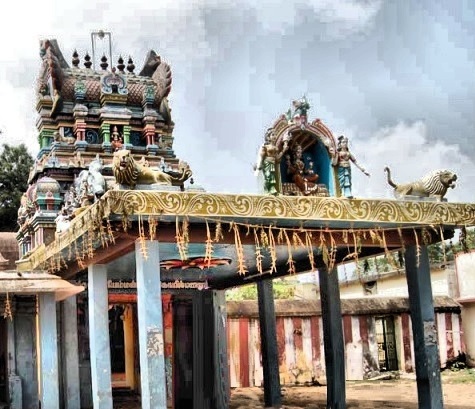 Probably Swami Sadasiva Brahmendrar identified the power energy of Goddess Punnainallur Mariamman buried there and revoked her from the pit to converted it into Goddess Mariamman thus enabling a temple to come up there for her worship. Few of the boons she bestow to her devotees are prosperity, valor, strength, wealth, offspring etc. 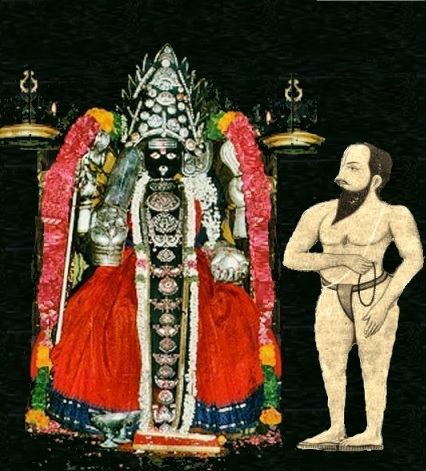 Two subordinate deities of Goddess Mariamman named Pachaikali and Pavalakali stand guard at the entrance of her sanctum as security guards or dwarapalakis. Those seeking boon for child, when gets conceived, pray Goddess Mariamman in this temple for safe delivery and offer bangles to dwarapalakis. Every year the procession deity of the temple is taken out for on a tour of 42 days sojourn in and around the entire Kumbakonam and Punnainallur and brought back to the temple. Since the main Deity is made of mud (mud idol converted from the ant hill) no abishekam called pouring of milk or scented water over the deity’s idol is performed here. The same is performed to Vishnu Durga idol located in the Sanctum. The devotees witness an unique event during summer when the main deity perspires which is real. The cause of this miracle baffles the devotees even to this day.